View of “We’re Not Here to Waste Time,” 2011. Foreground: Nava Lubelski, Remains of the Night, 2011. Background from left: Nava Lubelski, Ounce of Cure, 2011; Structurally Sound, 2011. 2685 South La Cienega Blvd. Amsler uses extruded acrylic paint to create latticelike structures that extend across geometric surfaces on walls in organic webs that often drip or cascade onto the floor. They seem to repel the imposition of boundaries with a quiet subversion akin to lichen overtaking rock. Lubelski’s graceful and moody embroidered textiles explore the value ascribed to one item or experience over another, such as new and old, present and memory. 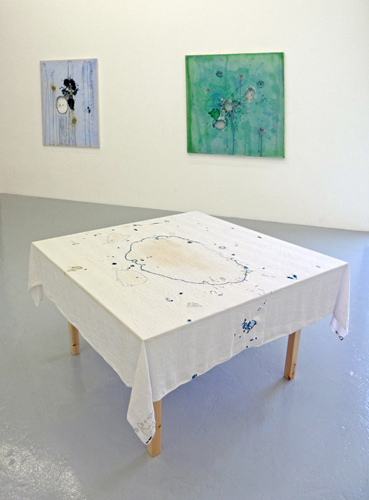 Her stitched designs on used fabric, including a stained tablecloth from a dinner with friends, elevate accident and remainder, that which is leftover or rejected, to art via a decorative practice. Barosh’s sculptural chairs sprout an array of armatures—shiny black drips, metal coils, and foam protuberances—suggesting both the exuberance and the violence of growing outside or through limitations and constraints.